The SXS Pro is a direct bolt in (no extra brackets required) to the Polaris RZR and will fit in the Arctic Cat Wildcat with our Wildcat brackets. Brackets are included with the seats to allow them to fit into most other side by side’s with little to no modifications. Years of research and design have gone into the creation of what is the best RZR and side by side seat in the industry. The all-new Corbeau SXS, combines everything that was missing in a quality side by side seat, with the quality and design that Corbeau is so well known for. 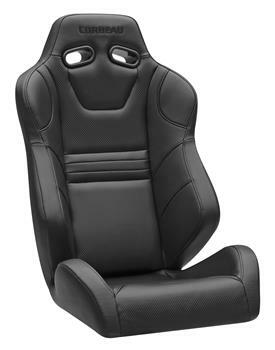 For over 50 years, Corbeau has provided the world with the best in seating, including carbon fiber race seats, European luxury seats, American Muscle seats, Off Road Suspension seats, and more. We used that expertise to come up with the SXS, which was specifically designed for the Polaris RZR and ACE but will fit in most other side by side’s. Some of the key differences that set the SXS apart from other side by side seats include; injection molded foam, plastic harness grommets, seat base water drain, waterproof seam sealant and strategically placed bolster support. If you remove the cover from the SXS and other side by side seats, you’ll notice that most other seats use cut foam, which becomes lumpy and wears down quickly, especially the way side by side’s are driven. The SXS uses an injection molded foam, which holds its shape and form for years and can withstand the aggressive driving commonly done with side by side’s. The shoulder harness slots on the SXS are not just a cut out of the material, which will wear out quickly when rubbed on by shoulder harnesses. The SXS uses a custom-made plastic harness grommet, which will prevent premature wear and tear to your seats. The angle of the seat base is such that the water will drain out the back of the seat through a small opening. You can also spray off your seats and the water will drain out the back. In an additional effort to protect the integrity of the foam, we’ve added a waterproof sealant to the seams of the cover. Most covers will allow water to seep into the foam through the seams but the waterproof sealant prevents this from happening. The seat comes with all the necessary brackets to install in your RZR and with the release tab in the back, can be removed in a matter of seconds. The SXS is available in all black, black/silver with silver offset stitching, black/orange with orange offset stitching, and black/white with red offset stitching. We use a carbon fiber vinyl for an added look of luxury and to provide added grip. Side by side specific harness belts are also available to compliment your SXS seats. Whether on the street or offroad, the SXS seat will not only improve the look of your vehicle but also your overall driving experience.